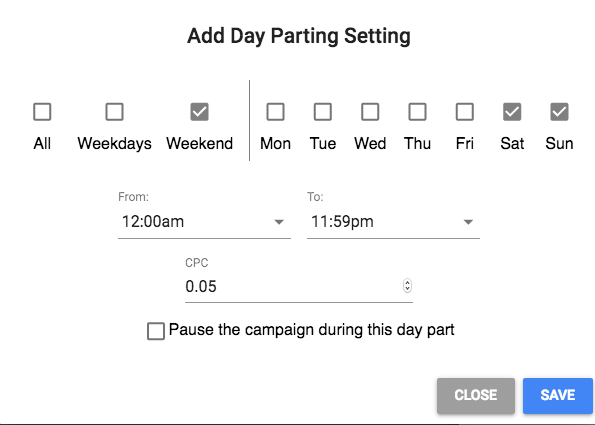 Day Parting allows you to set a static CPC or pause the campaign during day parting hours. If day parting uses a static CPC, Maximus offers the option to reset the CPC after the day parting period is over. Day parting can be set for weekdays, weekends, or individual days. During CPC day parting, site bids will be removed unless those site bids are paused when day parting occurs. A campaign must be active during the specified times in order for Day Parting to go into effect. Your campaign will start with no day parting, but this can be added during the Fire & Forget ™ step in the Add Campaign process or in the Fire & Forget™ Settings option on the menu of Campaign Details. From this section you can select specific days of the week and times of the week, or apply it to weekdays, weekend, or every day of the week. If you set a day parting window that starts before the current time, the next time Fire & Forget™ runs, your campaign will enter that day parting window. Campaigns have an option for Maximus to reset the CPC after day parting (only for CPC day parting, not pausing). If chosen, Maximus will reset the CPC to the CPC that was set before day parting started. Restore CPC does not work on site bidding if you use a static day parting CPC. Site bids are set to the day parting CPC and when Restore CPC goes into effect, the site CPCs will all use the restored campaign CPC. If you are using day parting with a Gemini campaign, Fire & Forget™ removes site bids so everything is bidding at your Gemini CPC. Fire & Forget™ will set the Gemini CPC to the lowest value possible to reach the static CPC you have set for day parting for the publisher group that is enabled under the "Fire & Forget™ Optimization." All bids are done with the publisher group modifier % at this point, and once your campaign exits CPC day parting your sites will continue to have the base bid equal to the Gemini CPC. You can change the CPC value of the day parting setting, switch to pausing instead of CPC, or switch to CPC value instead of pausing through the Fire & Forget™ drawer on the campaign details page. If the day parting is set to paused, click on Paused in the CPC column and then uncheck the box and enter the desired CPC. Then click Save. The opposite change can be made going from CPC to Paused. Maximus offers the option to either set a static CPC or pause the campaign during this time. If paused, the campaign will be restarted after day parting is over. In order to set Day Parting overnight, say from 10pm to 6am, you must do it by the time in a single day period (12:00am to 11:59pm). To set this up, add a Day Parting setting from 10:00pm to 11:59pm, and another setting from 12:00am to 6:00am. If you want to enable pausing or a set bid during day parting, you should be aware of what bid CPC value your campaign will have once it exits day parting. In the previous How To, a campaign was set to day part from 10pm to 6am with a static CPC of $0.07. If Restore CPC is turned off, a campaign will exit day parting keeping the CPC that was set during day parting. At 6:01am this campaign would have a CPC of $0.07. If the Restore CPC featured was enabled, the CPC would be whatever it was right before day parting began. In this same example, let's say Fire & Forget™ Optimization had grown the CPC to $0.30 and this was the value right before day parting began the previous night at 10pm. At 6:01am the CPC would then be $0.30. What if $0.07 is too low to come out of day parting without Restore CPC enabled? Do you want your campaign to begin bidding at a higher amount? What if $0.30 is too high when using Restore CPC? Do you want the campaign to begin bidding at a lower amount, but not $0.07? While Fire & Forget™ is enabled, it will eventually change the bid once clicks come in with Desired Click Pacing or Acceptable Profit. Those first clicks out of day parting could be spending much higher or lower than necessary for what performance of the campaign is in the morning. To have the campaign start optimizing at a different bid amount, create a new day parting setting with your desired CPC and set the time for 15 minutes. Since in this example campaign comes out of day parting at 6:00am, add a new day parting setting so that it will exit this small window with that desired CPC to start optimizing at 6:15am. Your campaign has been running for a week, been spending from 10pm to 8am but has not received any conversions during that time period. Set a day parting window for All days, and then set it to pause from 10pm to 11:59pm. Set a day parting window for All days, and then set it to pause from 12am to 8am. Day parting will prevent any spending during these hours, and the campaign will resume in the morning when it has the best chance to get conversions. Day Parting is very useful to manage the campaign spend to maximize campaign performance. Analyze the By Hour Report or Chart and see what times of the day, and what days, need to have a set lower CPC or could be paused completely. Some campaigns perform poorly on the weekends, so setting a lower bid or pausing during that time can help you protect your spend. Many campaigns don't do well during night and early morning hours, so setting a day parting window to compensate for this puts your campaign in a better position to remain profitable. Use a short day parting window to create a new base CPC for your campaign to begin bidding at a certain CPC for times throughout the day.